Meeting and event facilities for nonprofits and mission-based organizations. Conveniently located in downtown Boston, The NonProfit Center features rentable meeting and event facilities for nonprofits. Our four meeting rooms include a newly renovated, state-of-the-art conference center that can accommodate large events or small meeting groups. The NonProfit Center facilities include multimedia equipment and an outdoor courtyard for breaks. Our conference center may be partitioned to accommodate your meeting needs. Learn more about the conference center here. In addition to our Community Conference Center, The NonProfit Center also has several meeting rooms available on its first floor to accommodate small gatherings. Rates are based on half-day rentals (up to 4 hours) or full-day rentals (up to 8 hours). Half-day rentals: up to 4 hours beginning at 8:00 a.m.
Full-day rental: up to 8 hours beginning at 8:00 a.m.
Evening rental: half-day rate beginning at 6:00 p.m. Weekend (Saturday only) rental: 8:00 a.m. to 4:00 p.m. Please note: Building and technical assistance services, including room set-up and clean-up, will not be available for evening or weekend rentals. A $50 fee for room set-up may be applied to special room configurations. Reservations will be accepted, subject to room availability, within 48 hours of receipt of a request. Reservations booked on a first-come, first-serve basis. We highly recommend reserving your room at least a month in advance. 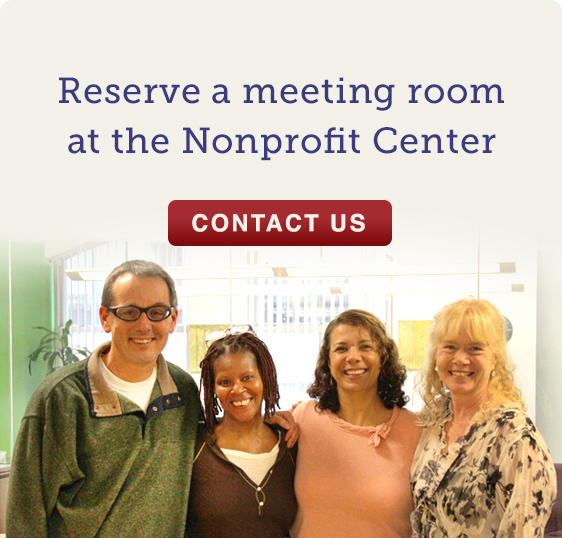 Reserve your meeting space at the NonProfit Center.